Right ON the beach, Coffee Shack boasts one of the best locations in South Africa. Coffee Bay is a remote village in rural Transkei that is still ruled by a strong traditional culture. 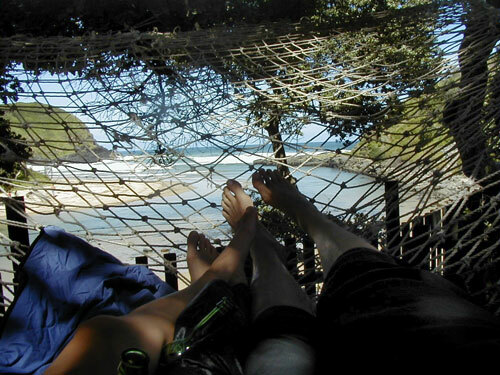 You will find plenty to do and can join a day trip with one of the Coffee Shack guides, head to the beach or find a hammock to relax in. Plenty of cultural experiences available, spend a night with a family, go on a village walk, go to the village for a traditional meal and learn how to dance Xhosa style. Learn how to surf, with the cheapest professional lessons available. 2hr surf lesson with board, wetsuit and professional instructor for only R40. Surfboards also available for hire. Go on a guided/self-guided hike to Hole in the Wall, Mpuzi Cliffs or Sacred Pools. You can eat, drink and be merry at Coffee Shack, with all meals available, a fun fully licensed bar, a free pool table. Other basic facilities include self-catering kitchens, internet, safe-parking, laundry, safe for valuables, shuttle service to town/airport. Arriving by bus- shuttle service available from Mthatha (Umtata) Shell Ultra City daily, bookings advisable. Driving -Take the N2 from either Durban or Port Elisabeth. The turn off to Coffee Bay is 20 Km South of Mthatha (Umtata). It is well sign posted. We are 84km from the turn off. Just follow the road until you arrive in Coffee Bay. There is signage to follow to Coffee Shack.